I was browsing through the Fly Baby home page when I noticed the discussion on seats. 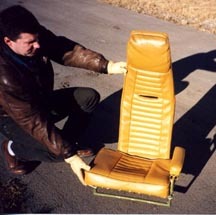 Before I had finished my Fly Baby C-GWIZ George Lemay let me fly his C-FXEY which had the original seat. As I am six - foot four I had a little trouble fitting into it so we took the padding off the seat back to give me a little more leg room and that combined with the flat seat made for a very uncomfortable ride. As a result I designed my own seat. I did quite a bit of research on aircraft seats and was interested to note that airliners have spent more than fifty thousand dollars for the seats of the pilots. Of course they spend thousands of hours in those seats so they have to be not only comfortable but safe. In one of my lives I was a Chiropractor so I was particularly concerned about spinal injuries and I wanted a seat that would give me as much protection as possible. 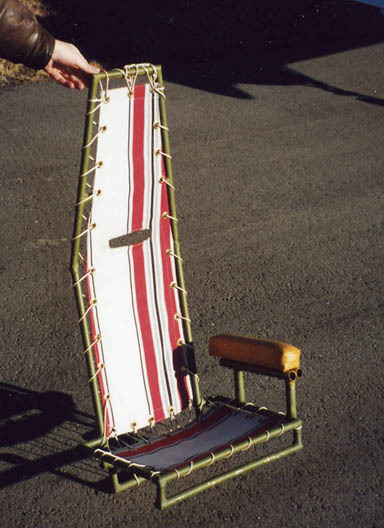 As you will notice in the accompanying drawing I designed the seat so that it projected two and one half inches behind the seat back and the seat back extends two and a half inches below the seat so that there is no solid member or anything hard in contact with the base of the spine. I also extended the back upward so that it protects above the head and neck in the event of a turn over. I at first thought that I would use 4130 steel tube as it was light and strong but it is very rigid and on second thought I thought I would use mild steel as it would have more energy - absorbing characteristics much as is designed in cars to absorb energy in a crash. I couldn't get tubing that was light enough so I wound up using ¾ electrical conduit which was light and had thin walls. It was messy stuff to weld and the zinc fumes that come off it are hazardous so if I did it again I would sand blast or wire brush the galvanizing off before welding. The next step was to get some canvas. I sewed a folded seam along the edges and but grommets in it. I then laced this to the frame as shown the photograph. If you are going to use a chute you can stop right here. I went one step further and got an upholstery shop to make me up a sponge rubber seat cushion and back covered in vinyl as shown in the second photo. The back has a slit for the shoulder harness and a head cushion. The turtledeck was raised for two reasons. First to accommodate the height of the seat back for the turnover protection and to offer more head protection itself and secondly to fair in better with the sliding canopy. This along with a cabin heater lets us fly earlier in the spring and later in the fall and occasionally in the winter. It also gives a lot more baggage space. I put seat-back grooves a la P-40 in the turtledeck but it took up room in the baggage compartment. I am enclosing the drawings of the turtledeck. The longest flight I have made was about two and a half hours on my way back from Oshkosh and the seat was very comfortable for that period of time. The energy absorbing ability of the seat was put to the test when I was trying to fly off the time restrictions. I was getting pretty bored staying within the twenty mile radius so I encouraged the other pilots to fly some time off. One of these tried to make a three - point landing. He flared about fifty feet above the ground and she pancaked in. The force broke all four landing gear struts, broke the prop and did a lot of damage to the engine compartment, but thanks to the rugged structure no damage to the airframe. The seat is supported at the front and at the back only against the bulkhead which allows the seat to be tilted forward to gain access to the baggage compartment. When we examined the seat it had collapsed about two inches and was easily straightened out. The pilot's only injury was a scratch on his finger when he tried to quickly cut the switches and hit the master turnbuckle on the way. The photos show an arm rest which I added later. Instead of the throttle mounted on the panel I used a side - mounted throttle quadrant with throttle and mixture control. I found a throttle control from a T-33 which is actually a large Bowden cable with a really smooth action and it just happened to be exactly the right length. The arm rest allows us to operate the throttle with just a little wrist action and it works extremely well. Eric's seat does seem the answer to the Fly Baby pilot's prayer. I think I'd reduce the height of the back enough to allow it to fit in front of the standard turtledeck that my 'Baby has.